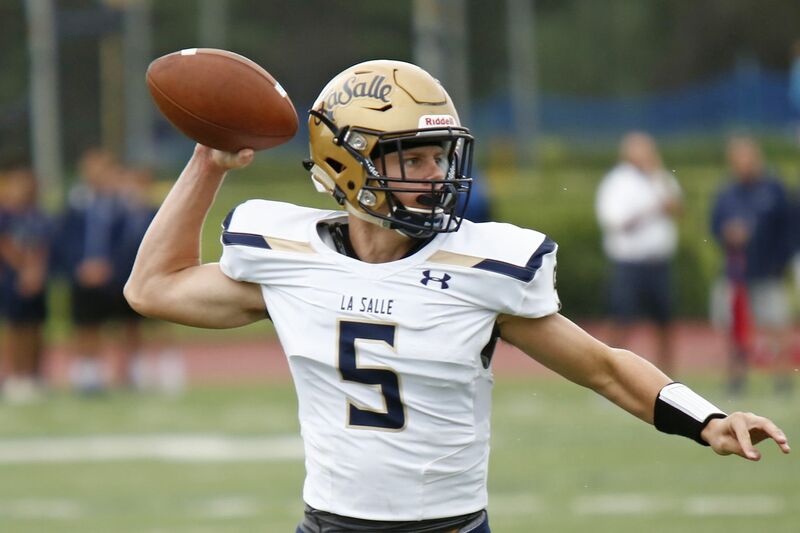 La Salle quarterback Sean Daly helped the Explorers pick up their first win of the season on Saturday. Manny Quiles ran for two touchdowns as La Salle football picked up its first win of the season with a 58-28 rout of Haverford School on Saturday. The Explorers ran their own version of the "Philly Special" when Liam Tatlonghari threw a touchdown pass to Sean Daly. La Salle started the season with losses to Imhotep Charter, North Penn and Malvern Prep. Archbishop Ryan took down Chester, 45-30, behind an explosive offensive performance. Julian Jones stared the game's scoring with three short touchdown runs. The Raiders improved to 4-0 on the season. Aviv Jackson scored from 12 yards out in the fourth quarter to give Jenkintown a 14-6 win against Lower Moreland. C.J. Jackmon added a 16-yard touchdown run for Jenkintown. Perkiomen Valley quarterback Cole Peterlin connected for three touchdowns with wide receiver Isaiah Domine to lead the Vikings to a 42-14 victory against Interboro. The touchdown passes went for 55, 44, and 28 yards. Peterlin also added a 23-yard touchdown run. Central Bucks West goalkeeper Dylan Smith recorded his fifth shutout of the season in the Bucks' 1-0 win over Downingtown West. Carson Snyder scored the lone goal. Nico Krueger and Max Lubowitz scored as Penn Charter blanked Father Judge, 2-0. Samuel Wilson netted two goals in Episcopal Academy's 2-1 victory over Germantown Friends. Ben Engstrom scored the only goal as Radnor beat Methacton, 1-0. Caitlin Donovan's overtime goal gave Conestoga a 2-1 victory over Unionville. Eliza Bailey leveled the game for the Pioneers late in the second half on a lofted shot from just outside the 18-yard box. Emily Meenan's two goals propelled Gwynedd Mercy past St. Basil, 4-1. Maggie Bordonaro's fourth goal of the season gave Methacton a 1-0 win over Garnet Valley. Liz Greene made 11 saves to earn the shutout. Downingtown East defeated Perkiomen Valley, 2-1, behind goals from Emily Buckner and Aliza Trasatti. Kate Christ recorded a hat trick as Spring-Ford handled Council Rock South, 4-0. Angelina Pinciotti had two assists. Four players scored for Plymouth Whitemarsh as the Colonials remained unbeaten with a 4-1 triumph over Pennsbury. Marple Newtown blanked Interboro, 5-0, thanks to a pair of goals from Ava Paoletti. Anna Lemaster made nine saves for the Tigers. Emma van der Veen had two goals as Agnes Irwin held off Radnor, 3-1. Eva Kinnel netted two goals in George School's 4-1 victory over Lansdale Catholic. Logan Clouser notched two goals and two assists as Hill School cruised past Pennington, 8-0. Josephine Palde added two goals and one assist, while Hayley Gable earned her first career shutout. La Salle won the Briarwood Invitational at Belmont Plateau. Vince Twomey finished 13 seconds behind race winner Colin Kane of Delsea. The Explorers had five runners finish in the top 20. West Springfield (Va.), Great Valley, West Chester East and Central Bucks East rounded out the top five. West Chester East finished second at the Briarwood Invitational. Ally Clarke won the race by 33 seconds in a time of 18:59. Central Bucks East and Council Rock North took fourth and fifth, respectively.